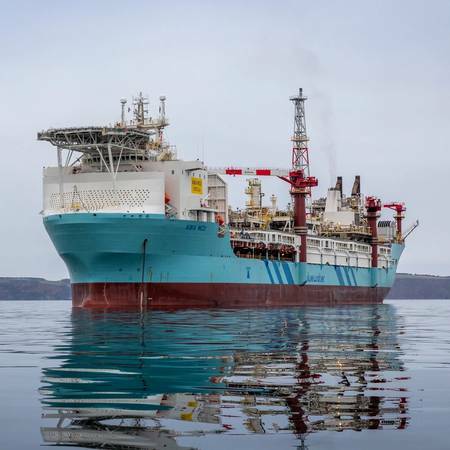 Hurricane Energy's floating production, storage and offloading (FPSO) vessel has been connected to the group's North Sea Lancaster oilfield, another milestone for the group as it seeks to extract so-called fractured basement oil in Britain. Hurricane specializes in recovering oil from fractures in hard and brittle rock known as fractured basement reservoirs, which some see as a risky way to obtain crude. "The Aoka Mizu FPSO arrived at the Lancaster field on 17 March 2019 and successfully hooked up to the turret mooring system buoy on the morning of 19 March 2019. The vessel is now on station and securely moored," Hurricane said. A rope getting snagged in January had delayed progress. Hurricane has targeted first oil from its Greater Lancaster Area (GLA) project, west of Scotland's Shetland Islands, in the first half of 2019. Any progress towards that is closely watched by the market. "After first oil, Hurricane anticipates a gradual ramp-up of production towards its planned average plateau rate of 17,000 barrel of oil per day." There is currently no fractured basin field in production in Britain. Lundin Petroleum in August announced good productivity from a fractured reservoir in the Norwegian North Sea. Together with its Greater Warwick Area (GWA) project, Hurricane aims to add net reserves of 750 million barrels to its portfolio.